Now, its time to talk X-Men, in particular, my favorite mutant - Kurt Wagner, better known as Nightcrawler. Now first off, we will not be discussing X2 Nightcrawler, but instead Nightcrawler's classic look that was implemented in the mid 1970s by creator Dave Cockrum - mostly black with a red "V". If you are interested in an in depth look at Nightcrawler, in particular his every changing look and style - I suggest you check out Alan Kistler 's Agent of S.T.Y.L.E. – The Swashbuckling Nightcrawler! It is amazing and worth the time to read. Nightcrawler holds an important role in the X-Men (despite what certain movie writers and directors think). 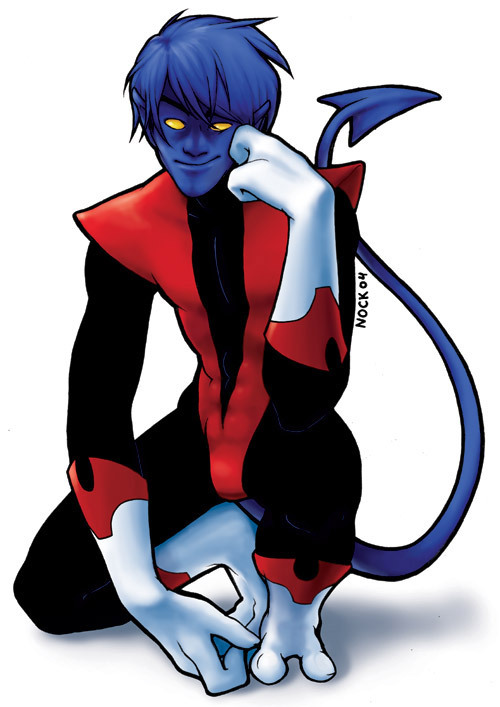 Nightcrawler was created by Dave Cockrum while he was in the Navy, stationed in Guam. Cockrum recalls a typhoon kept him awake one night, which led him to sketch. During this sketch session he created a new character - Nightcrawler, who happened to look a lot like the classic Nightcrawler we have come to know and love, but he wore only shorts instead of a full costume. Nightcrawler at this time was a demon, who after flubbing a mission stuck around instead of facing punishment back in hell. His origin story has definitely changed over the years: he becomes German, has a stint in the circus, and we find out his parental units are much more complicated and ingrained in mutant culture than one could ever imagine. Unlike some mutants his outward appearance does not make it easy to hide: blue-black fur covers his body, he only has two fingers and an opposable thumb on each hand, only two long toes on each foot, fang-like canine teeth, pointed ears, a tail that supports his weight and allows for balance, and did I mention yellow eyes? Oh, and if that is not enough, let's talk about his real mutant power: superhuman agility, teleportation (both short and long distances), adhesive hands and feet, and his blue-black skin allows him to become invisible in the shadows. Oh and he can wield a sword thanks to his fascination with swashbuckling fiction, in particular Errol Flynn. If his strength and skill are not enough - well then let's just throw in his good heart, his nature of teasing and practical jokes, his ability to have faith despite the odds, a bit of a ladies man (just ask Amanda Sefton - also known as Jimaine Szardos, Daytripper or the second Magik), not to mention he when he teleports in and out you not only get a puff of pink smoke but the amazing sound that is BAMF! Who does not love that word? Bamf to me is Nightcrawler. Not bad for a guy who original was designed to look like a demon. How does one casual cosplay as a fury blue-black mutant. Easy! For my take on Nightcrawler's classic costume, I started with the basics: black long sleeve thumb hole shirt, black dress, black tights, and black boots. I simply layered the look with a slightly over sized red cardigan - scrunching up the sleeves. A little blue eyeliner and a handmade hot pink felt BAMF necklace (used a template to cut out the design and then sewed it on to a metal chain necklace - easy as that to accessorize in casual cosplay) pulls the whole look together. I think I am ready to teleport, swashbuckle, or at least goof around with my fellow mutants, I mean friends.